Similar button feel to camera. Wheel has less quality than the Canon. Very similar to Canon grips. 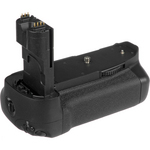 Good overview on battery grips, I leave my Canon grip on my 7D almost all the time and love it. I did want to point out that the links seem to be broken. Ah, thank you. Fixed now. Thanks for the review. It is always nice to have someone else (professional) like and even buy the same gear that I have chosen. 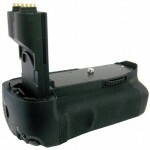 I think these are a must have because the batteries go pretty fast when shooting vdo. Is it at all possible (even if OEM grips only are considered) to purchase extra battery trays? I have batteries and I want a grip, but to change batteries I do not want to buy 6 grips. It seems like such a simple request, but can’t seem to find just the trays so that I can swap cartridges rather than the entire grip. With respect to the lens offset, what kind of DIY rigs have you seen to re-adjust the alignment for rod supports? Simple bracket? Cheese plate? Something else? Also, what other compensations do you have to make (and how do you do that) to make the rod gear gack work on this new higher height? I was hoping you could elaborate on the kinds of rigs you’ve seen or would suggest to compensate for the offset issue you mentioned. Also, the height of the camera obviously rises – what kind of adjustments do you need to make to the rest of your rig (for example, how do you get the follow focus to connect now). Lastly, it looks like Polaroid also makes a grip for the 7D. Have you tried it? Looks good (display on back and comes with corless remote that can function as an intervelometer). 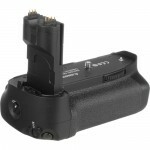 I am finding I have not been using the battery grip with my larger rigs. But I love it for mobile stuff or small setups. I have not used that grip I am afraid.